So my question is, did you just stumble upon a bit of random forest bliss or did you purposely seek out this lovely setting? Or… did you even have a hand in creating this little oasis? 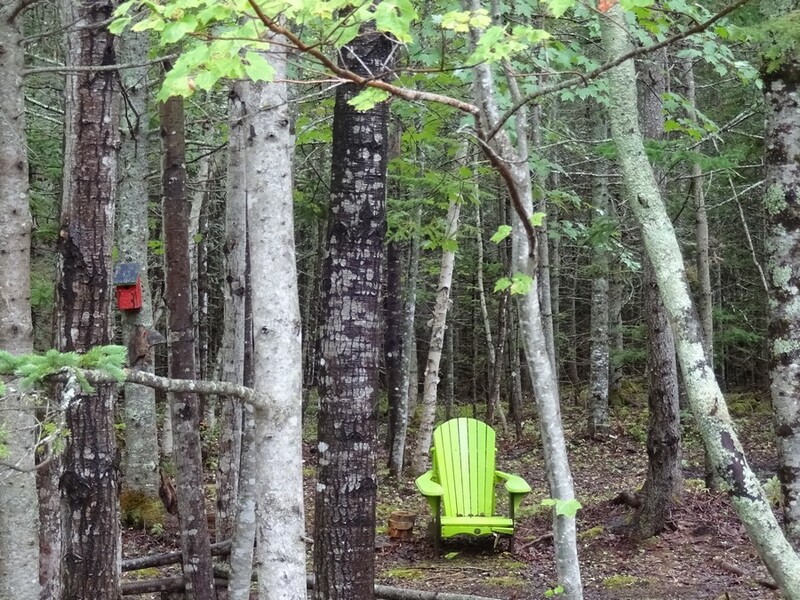 In any event, I love the bright lime Muskoka chair and the tiny red bird house set amidst nature! Do Ontarians call these Muskoka chairs? Yes! What do you call them? We call them Adirondack chairs here at this end of the country too. But I like the idea of a local variation: Fogo chairs? Heart’s Delight chairs? No, I know: Bay Despair Chairs! And re the photo, just ahhhhhhhhhh! Huge sigh of relaxation and delight. So lovely! Your creation? Can your photos be shared on FB…I like to match photos and meaningful words .